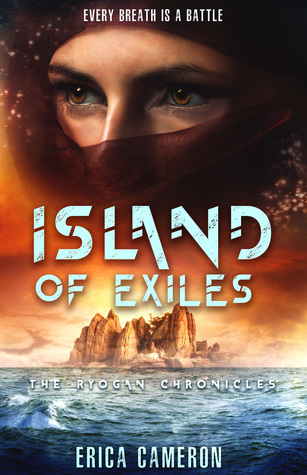 We're lucky to have Erica Cameron here to guide us through the ISLAND OF EXILES, the first book in The Ryogan Chronicles. Erica, what was your inspiration for writing ISLAND OF EXILES? I can’t remember what sparked the question, but for a while back in 2014, I wondered what a society would look like if their entire culture was based on aggression. An exaggerated version of the “survival of the fittest” theory. This question and concept remains in the book, but it’s become a very small question in a much larger world and story. What it did do was physically shape the island of Shiara into the deadly desert you see in EXILES now. It also guided a lot of my decisions regarding the structure of Itagami’s government and society. How long did you work on ISLAND OF EXILES? Although I tied this trilogy into a world I’ve been building since 2008, I didn’t start writing ISLAND until 2012. After a year, my agent helped me develop a proposal based on the chapters I’d written, and the book went on submission. It wasn’t until after Kate Brauning bought the series for Entangled that I took her notes, worked on reimagining the story, and finally finished the first draft in 2015. Three years is a long time to work on one book, but it was worth the wait to be able to have Kate’s guidance on the project. Worldbuilding. I learned so much about worldbuilding writing this series, especially specifically how to manage and keep track of all the intricate details I built into Shiara. My OneNote notebook for this series is well over 400 pages when I export it to a PDF. It contains research into death rituals, desert plants, weather patterns, and energy. I have dictionaries of specific words in other languages and the glossaries I created using those words as guides. What I learned from ISLAND OF EXILES is how to build something exceedingly complex without making it a labyrinth I can’t find my way out of. I also learned I really, really enjoy doing exactly that. The building part, not the labyrinth part. I have had a very strange road from deciding to write a book to seeing my first one published. ISLAND OF EXILES is my seventh published book, but it’s the eighteenth book I’ve completed. I think. If I’m counting correctly. Or unless I’ve forgotten something, which is a strong possibility. The first book I ever published was Sing Sweet Nightingale, the first book of The Dream War Saga, but it was my third original novel. Getting to see it in print practically happened by accident—I wrote about it on my blog a while back, but it essentially involved a crashed party, excellent best friends, and a fumbling pitch that somehow turned into a contract in 2012. From that point, I fell sideways into a contract with Danielle Chiotti after a conference in 2013. During the next two years, we went on submission with two different projects, one of which I self-published with Lani’s help and the other which eventually sold to Kate at Entangled after I met her at a convention in 2015. Island of Exiles and the rest of the Ryogan Chronicles series came out of my partnership with her, and I love what we’ve been able to develop from the concept I originally handed her. Hopefully everyone else who reads it will too! You can’t fix what doesn’t exist. Finishing a book is tough, but it’s the first and most important part of writing. Fixing a book can be tougher, however it’s literally impossible if you don’t have a finished book to rearrange and polish and pretty up. The second best piece of advice I offer to people is this: listen to what people tell you that you “should” do, try the bits you like, and only keep what works. Everyone has a different process, and their brains create material in different ways. What works for one person can help someone else, but it won’t necessarily. And that’s okay. The problem comes when someone gets told there’s a “right” way to write and they spend months or years trying to make the “right” way work for them. Don’t do that to yourself—following someone else’s path really only ever works if you’re hiking. In addition to wrapping up the last two books of The Ryogan Chronicles, I’m currently working on the next book of The Dream War Saga! After those projects are done, I get to launch myself into space. Not literally, but still. Pax Novis is a sci-fi trilogy I’m working on with Kate and Entangled, and I am extremely excited to enter that world. But when following the clan and obeying their leaders could cost her brother his life, Khya's home becomes a deadly trap. The only person who can help is Tessen, her lifelong rival and the boy who challenges her at every turn. The council she hoped to join has betrayed her, and their secrets, hundreds of years deep, reach around a world she's never seen. After a lifelong obsession with books, Erica Cameron spent her college years studying psychology and creative writing, basically getting credit for reading and learning how to make stories of her own. Now, she’s the author of several series for young adults. She’s also a reader, asexuality advocate, dance fan, choreographer, singer, lover of musical theater, movie obsessed, sucker for romance, Florida resident, and quasi-recluse who loves the beach but hates the heat, has equal passion for the art of Salvador Dali and Venetian Carnival masks, has a penchant for unique jewelry and sun/moon décor pieces, and a desire to travel the entire world on a cruise ship. Or a private yacht. You know, whatever works. Have you had a chance to read ISLAND OF EXILES yet? What sort of details do you conjure up about the world you create while writing? Have you ever crashed a party to pitch a story? What are some of the craziest things you have done for your book? Share your thoughts about the interview in the comments!